Diet Selector: What's the Best Diet for Me? The Diet Selector: From Atkins to The Zone, More Than 50 Ways to Help You Find the Best Diet for You< was written by Judith Rodriguez, a nutritionist and clinical dietitian. Rodriguez says about popular diets: “Just because it is on the bookshelf, or the name is on a door, it does not mean it is a healthy, well-rounded program”. She wrote this book to outline the pros and cons of a variety of different diets to help you decide the plan that is best for you. In The Diet Selector Rodriguez evaluates 50 weight loss diets and 25 health promoting and disease management diets. Each diet is given a rating in a number of categories including “long-term usability, flexibility, family-friendliness, cost, and how strong the science is behind the claims of a diet”. This rating system is designed to help dieters decide what will work with their preferences and lifestyle. For example, dieters who like eating bread and other carbohydrates and have difficulty cutting back on them may enjoy a plan that includes whole grains, rice, pasta, breads and lots of vegetables and fruits. Examples are the Mediterranean Diet or the DASH diet. Dieters that don’t enjoy cooking or find it difficult to prepare meals may prefer a plan that provides prepared meals such as Nutrisystem, Diet-to-go or Weight Watchers. In addition to the analysis of 75 diets Rodriguez also provides readers with tips on how to approach weight loss from the perspective of a long-term healthy lifestyle, how to determine your ideal weight and information about eating disorders. The Diet Selector analyzes and compares various diets, some of which may include an exercise component. Rodriguez also provides tips on how to safely increase physical activity levels as part of a long-term lifestyle approach to healthy weight loss. 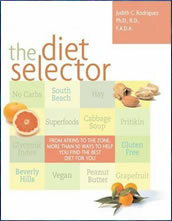 The Diet Selector: From Atkins to The Zone, More Than 50 Ways to Help You Find the Best Diet for You retails at $19.95. Identifies the advantages and disadvantages of a variety of common diets. Concise and visually appealing presentation. Addresses nutritional management of low metabolism, heart disease, thyroid problems, migraines and allergies. Is not a diet or weight loss program and only helps readers answer the question, “which diet is best for me?”. Readers will need to buy additional materials to learn how to do their chosen diet correctly. The Diet Selector will appeal to dieters who are confused with the variety of different diets available. It will help dieters to choose a diet that best fits with their preferences, lifestyle, goals and budget.